I’ve always been intrigued by gadgets like the Chumby that you can program to display news, weather, and other content in real-time. But I’ve never found such devices quite compelling enough to spend money on, and since I already have an iPad (s aapl) and a smartphone, I have enough other ways of looking at such apps already. So for people like me, the folks at Stem Innovation have come up with the TimeCommand, which will let you turn your iPod, iPhone or iPad into a Chumby-like device, and charge it at the same time. 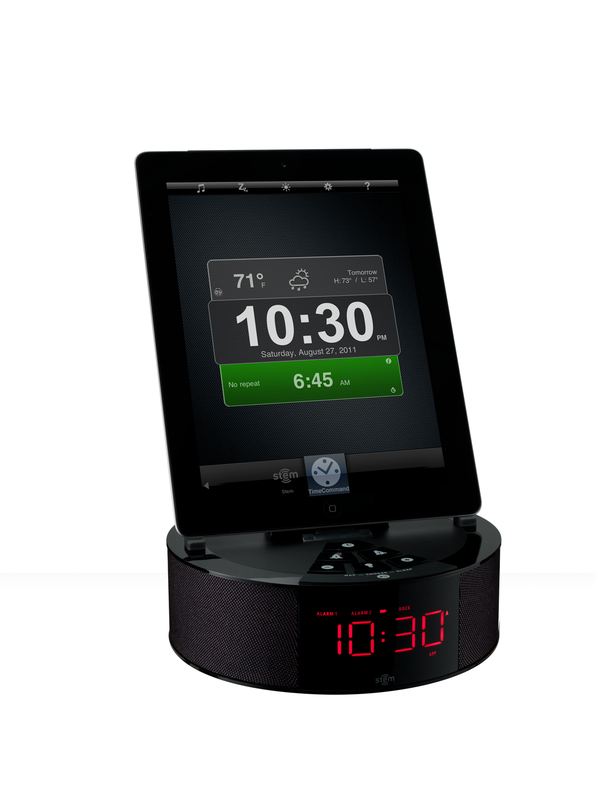 By itself, the TimeCommand is a perfectly acceptable dual alarm clock with dimmable display. Plug in an iDevice running the free Stem:Connect app, and it can wake you to music or Internet radio, or even turn on a lamp. 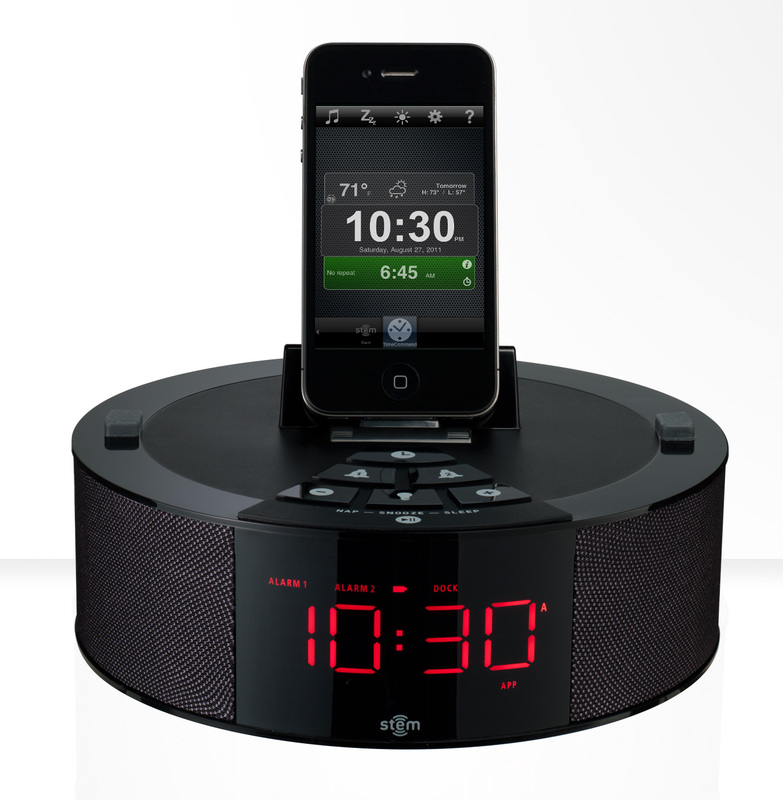 It has a snooze feature and a battery backup, too, in case the power goes out. Stem:Connnect won’t show you the latest news, but you can choose your music, adjust the sound, set an alarm, dim the display, and check the weather without leaving the app. The app also includes a graphic equalizer to let you tweak the dock’s sound, which I found performed well, both for playing music and for voice conversations using an app like Bria. The TimeCommand’s round shape is useful for being able to see its clock from various angles, too. 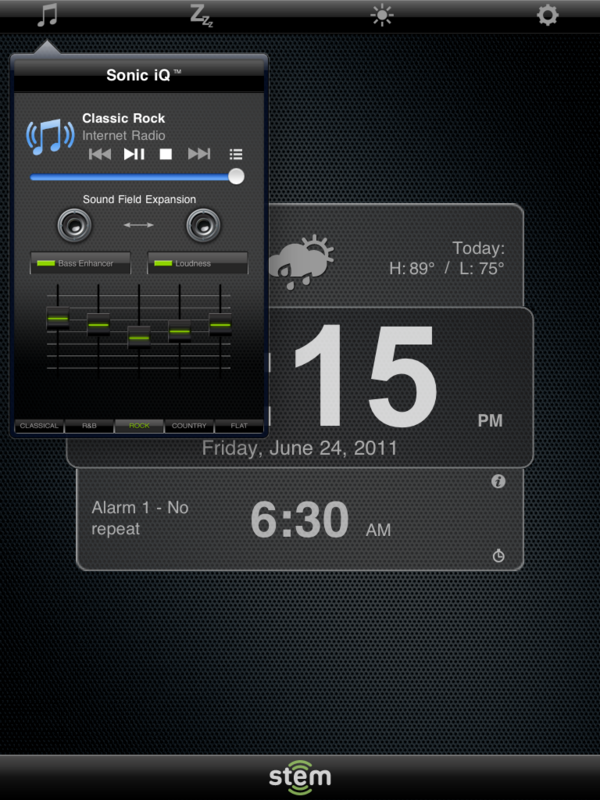 I tried using the TimeCommand with both an iPad and an iPod touch, and found that it interacted well with both. The app has been designed for both screen sizes. Even the dock connector itself can move enough to work without taking your iDevice out of its case (depending on the case’s thickness, of course). It even works with other iPods, like the nano, though obviously you can’t use the iOS app with these. My only complaint is one that isn’t really the TimeCommand’s fault. It gets its time from the iDevice, and updates itself automatically when docked. Unfortunately, Wi-Fi iPads and iPod touches have no way of maintaining accurate time from an online server, so you’ll need to make sure the device is set correctly. The TimeCommand is available for $99, which is a little pricey — you could buy a Chumby One for less than that — but if you already have an iDevice, the TimeCommand might be a useful place to park it, by your bed or your easy chair. Disclaimer: The TimeCommand was provided to us by the manufacturer for the purposes of this review. What none of these clock apps point out is that a fully dimmed, mostly black iPad screen is bright enough to light up half of the average sized bedroom. I cover mine with a black cloth that came with a PC laptop as a keyboard protector and it still puts out a decent pool of light. Turn the brightness down not in the app, but in the preferences of your iPad.